Here is the next piece of the pattern. 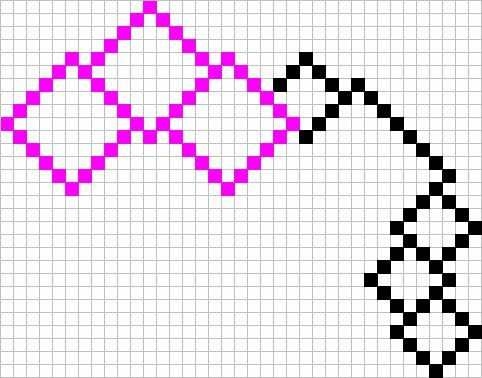 Remember, last week’s part of the pattern is in pink, and the new part is in black. The squares represent one Kloster block – 5 satin stitches over 4 threads. Pivot in the shared corners. Any questions, ask! Stitch time on week 2 was about 1.5 hours – including stopping to make dinner and chase a 3yo with a suspicious smelling Pull-Up. So actual stitch time was probably about 1 hour on this one as well.WIP on the pattern is for the center – I think I’ll have a couple of options: either a season-neutral design, or a small autumn saying. I should be done posting patterns a few weeks before Thanksgiving.